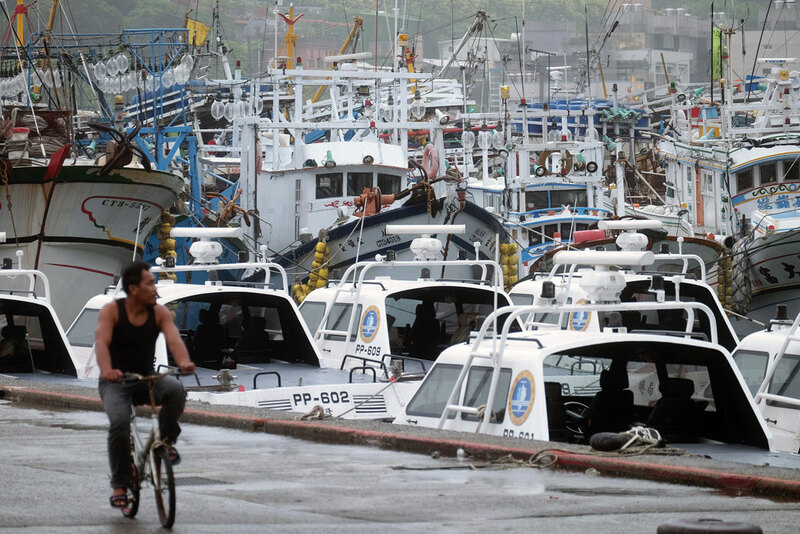 A fisheries worker rides a bicycle past fishing ships docked at Partouze Harbour in Keelung as Typhoon Chan-hom brings rain to northern Taiwan on July 10, 2015. Reform of the Taiwanese fishing sector will strengthen bilateral ties between Taipei and Washington and enhance global perceptions of Taiwanese democracy. For all these achievements, however, one aspect of Taiwan’s governance remains in urgent need of reform: oversight of the Taiwanese fishing fleet, which has a long history of environmental and labor abuses, including overfishing, seafood fraud, and use of forced labor. Over the past year, President Tsai Ing-wen and her allies in Taiwan’s legislature have instituted much-needed measures to curb these abuses, but it is uncertain whether the political will exists in Taipei to ensure effective implementation. There is much at stake in this reform program. At a time when Taiwan’s international identity is increasingly linked to its democratic values and commitment to rule of law, the malfeasance of the Taiwanese fleet detracts from Taipei’s standing as a responsible global citizen. This report examines the governance challenges facing the Taiwanese fishing industry in the context of U.S.-Taiwanese relations. It provides background on the Taiwanese fishing industry before looking specifically at the Taiwanese fleet’s history of abusive practice and the Tsai administration’s reform efforts. The report contends that reform of the Taiwanese fishing sector is an important undertaking that will strengthen bilateral ties between Taipei and Washington and enhance global perceptions of Taiwanese democracy. To that end, the report offers recommendations on how the United States can encourage and support Taiwan’s efforts to bring its fishing fleet into compliance with domestic and international law. As Taiwan’s fishing industry continues to expand, it will need to address human rights issues and the problem of illegal, unreported, and unregulated (IUU) fishing. These are discussed in detail in the next section. In recent years, Thailand has received the lion’s share of media coverage and international pressure relating to environmental and labor abuses in the seafood industry.40 Yet there is a compelling case that Taiwan’s fishing fleet deserves equal attention. Unlike with the Thai seafood industry, most of the abuses associated with the Taiwanese industry occur on the high seas or in other states’ EEZs. Not only are such abuses harder to detect and expose than those occurring in seafood processing plants and nearshore fisheries, but they are also an affront to the norms of international law and reflect a conscious predation on the limited governance capacity of weak and impoverished states. If current efforts to reform the Taiwanese fishing fleet fall short, that failure could prove a hindrance to effective U.S.-Taiwanese relations. As Taiwan’s international profile and diplomacy continue to evolve beyond a Cold War model, the discussion surrounding Taiwan’s de facto political autonomy from mainland China has centered on the island’s democratic and pluralistic values. This trend has intensified in recent years, as watershed developments in Taiwanese politics, such as the emergence of a new youth-focused political party, the New Power Party; the election of President Tsai; and the recent marriage equality ruling have occurred alongside Beijing’s successful campaign to persuade the small number of governments that still formally recognize Taipei to sever diplomatic ties.43 Should Taipei appear to be tolerating violations of domestic and international law committed under its own flag, it would detract from Taiwan’s emerging status as a responsible global citizen that respects the rule of law and human dignity. That deficiency would undermine the argument advanced by many in the U.S. policy community that Taiwan’s cultural and political achievements should be supported amid East Asia’s shifting geopolitical landscape. Should Taiwan receive an EU red card or suffer a downgrade in the annual State Department Trafficking in Persons (TIP) report, such a position would become harder to defend. In addition to encouraging Taiwanese authorities to make fisheries oversight a priority, the United States should promote and foster greater Taiwanese involvement in international fisheries management. To date, Taiwan has not been able to join the Indian Ocean Tuna Commission (IOTC)—an important RMFO that manages tuna stocks in waters where Taiwanese vessels are highly active—because the body was established by the FAO, a U.N. entity that excludes Taiwan.46 Taiwan’s absence from the IOTC limits Taipei’s ability to ensure that its fishing fleet complies with IOTC decisions and undermines the IOTC’s effectiveness in controlling tuna harvest in the Indian Ocean. If Taiwan is going to play a constructive role in managing global seafood resources, it needs to participate in fisheries management processes relating to waters where its fleet is present in significant numbers. As a leading actor in the fisheries space, the United States should work with its international partners to identify ways Taipei can exercise participatory rights in the IOTC—and if possible, in fishing-related FAO fora—ideally in the same fishing entity capacity as in other RMFOs. The United States should also seek to strengthen and facilitate Taiwanese participation in the fight against IUU fishing. This could entail organizing multinational law enforcement exercises focused on illegal fishing that include Taiwan’s coast guard in an observer capacity. It could also include periodic joint fisheries patrols modeled on an operation that the United States and Taiwan conducted in 2014 under an informal cooperation agreement known as the Lan Hai Charter.47 At present, Taiwan does not engage in counter-IUU drills or patrols with international partners. However, recent collaboration among the maritime forces of Japan, Vietnam, and Thailand to address rogue fishing practices suggests that there is growing regional interest in East Asia in bilateral and multilateral cooperation on IUU issues.48 With U.S. support, Taiwan could contribute to these collaborative efforts. Taipei’s efforts to define a role for itself in the international arena are at a pivotal juncture as Cold War rivalries fade from view and a new generation of political voices seeks to bring a distinctly Taiwanese identity to the island’s external relations. Curbing impunity in the Taiwanese fishing fleet would send a strong signal to the rest of the world that Taiwan is a responsible international actor willing to make good-faith efforts to confront pressing global challenges even where they require difficult adjustments at home. To that end, the United States should encourage Taipei to continue down the path of reform that it embarked on following President’s Tsai’s election last year. Avery Siciliano is a former research associate for Ocean Policy at the Center. The authors would like to thank Yi Chiao Lee and Greenpeace International for their insight in drafting this report.